Yesterday, a simple trip to the mall turned into the greatest scavenger hunt in the history of mankind. Last weekend, S and I got a Christmas present for my mom from the ultra-fancy Neiman Marcus. (I’m not mentioning what said gift is in case my mom is reading. In case I’m right, hi mom!) As it turned out, if you spend over $100, you got a free $50 gift certificate to the store. Awesome, right? I was overjoyed, thinking of the one pair of underwear I might be able to buy without going over. Maybe. If it was cotton. Unfortunately, our exciting gift certificate came with rules. It could not be used on: cosmetics, fragrances, undergarments, gift cards, online purchase, certain brands or sale items. There were probably more exclusions listed, but we stopped listening. There went my new pair of underwear, or $40 nail polish. There went any hope of using the gift certificate because what, pray tell, was actually affordable at NM at full price? Last night I decided to see. S begrudgingly came along. It’s not like he hates shopping like most men, he just hates certain stores, such as ones like NM where you feel like a total outcast. Where wearing Target isn’t considered cool. He was also convinced I was on a failed mission. I had to prove him wrong. We searched the store for a bit and were happy to find a few gift bags full of teas and hot chocolate for around $15. Fantastic! We figured we might need a generic gift for someone. So we picked two up. On the way to the cash register, we found something else that I just needed. There, on a display, was the ugliest and best thing I had ever seen. 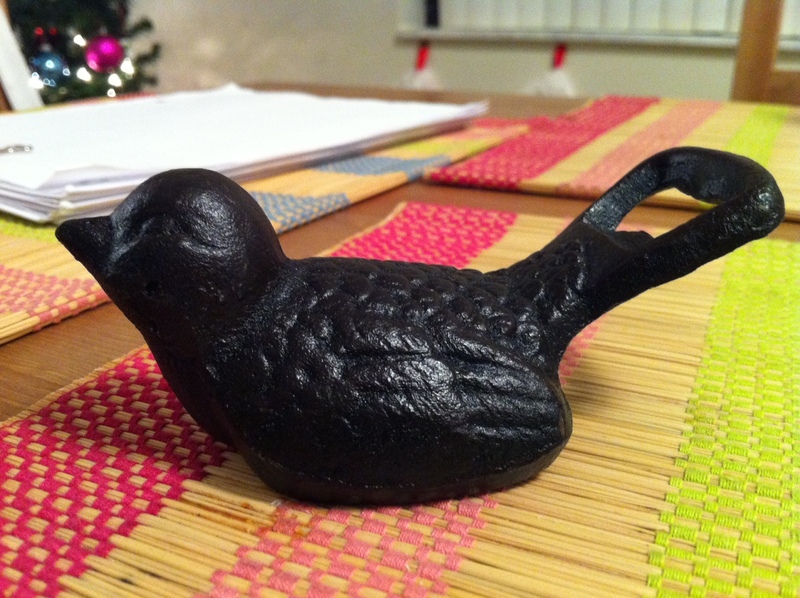 It was an iron bird bottle opener. For $10 it was a steal. I needed it. I had just built us a bar, so it was meant to be. With the bird we were right around $40. Our mission was complete. At that point the lights were dimmed. Apparently NM closes an hour before the rest of the mall. We didn’t know that, so we ran to the register and apologized profusely. Thankfully, the employee was super nice. Which was awesome because our transaction was doomed from the start. The gift card, as it turned out, was a mystery to everyone. He had to call a manager to help figure it out. (1st call) It was then that we learned we couldn’t use it on the food items. And then he was gone, running back to the display to get three more ugly birds. Birds for everyone! I didn’t even consider who we’d give the rest to. Really, who would want such a weird Christmas gift? Clearly someone we didn’t want to be friends with anymore. I’d never seen S move so quickly. Like a flash he was back, birds in hand. Apparently he grabbed the last ones. The guy rang them up and yet again we were met with a problem. (Call to manger #2) Apparently you had to spend $50 minimum. Oh NM, you think you’re tricky don’t you? But you can’t mess with us. I looked over at S and yelled. Now with five ugly birds, we were ready for the register. Quickly thinking, S spotted something else. Socks! Apparently ONE PAIR of socks was $12. So we swapped out three of the birds and got socks. During the ride home I laughed for 30 minutes straight. Because, seriously, who would we have given four ugly birds to? That bird isn’t ugly, it’s super cute! HAHA! I have to agree. S thinks it’s hideous, but I’m in love. P.S. Look what I bought today at West Elm…you inspired me, HAHA! i’m with pam, i’m sad i’m not getting a bird. i mean, really, you went with something useful like socks?! all kidding aside, i have two observations: (1) you guys really have a bad history with shopping. i think the world hates you as consumers. and (2) you very much needed a bottle opener, and this was therefore a logical, practical, and rational purchase. one day samir’s keychain would be missing and the apartment would be anarchy. we’d be opening our beer on the railing outside, the rack of the broken oven, or, God forbid, with one of your shiny new knives and then we would truly know what hell is like. or we’d just call ben and he’d show up with four bottle openers and a vat or liquor. either way, mayhem. so, in the end, neiman marcus saved us all from certain doom. happy Christmas to all, and to all a good night. I can’t articulate how much this made me laugh. EVERY SINGLE PART OF IT. But seriously, just try to picture Samir yelling “THREE MORE BIRDS!” It was glorious. I can’t wait for you to use the bottle opener now. PARTY PARTY PARTY. 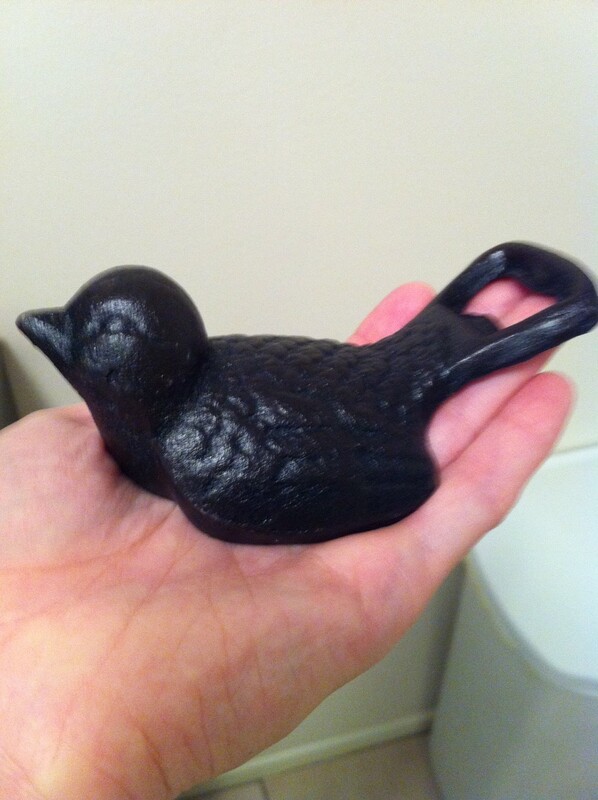 I BOUGHT THAT SAME BIRD AS A GIFT FOR MY ROOMMATE CASSIE!!!!!!!!!!!! The only way I would think that bird is ugly is if it was a pigeon. I don’t care what Bert says. To be fair, Ernie was the cooler one of the pair.